The earliest stage of gum disease is known as Gingivitis. Gingivitis is inflammation of the gums; it is the initial stage of gum disease and the easiest to treat. The direct cause of gingivitis is plaque. Plaque is the soft, sticky colourless film of bacteria that forms constantly on the teeth and gums. If plaque is not removed by daily brushing and flossing, it produces toxins (poisons) that can irritate the gum tissue, causing gingivitis. 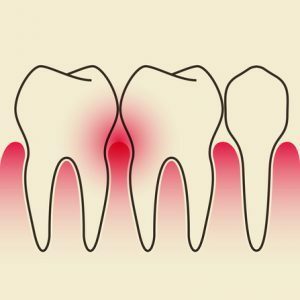 At this early stage in gum disease, damage can be reversed, since the bone and connective tissue that hold the teeth in place are not yet affected. Left untreated, however gingivitis can become periodontitis and cause permanent damage to your teeth and jaw which may lead to tooth loss.